I purchased a Verifone Omni 396 from an eBay seller to use as the basis for an interesting project. 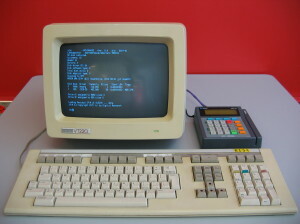 The result was a CP/M based computer, with a 416KB battery backed RAM disk, multiple serial ports, and MicroSD storage. This was accomplished with only one trace cut on the system. Leaving out the MicroSD adapter allows for the installation of CP/M and RAM disk with no changes at all! For the lengthy story, please see here. Technical details of the Verifone Omni 396 are here. The firmware upload/download protocol is here. that is an amazing project. thanks for sharing!